HOUSTON, April 8, 2018 – Six women were named to the U.S. Women’s Team for the 2018 Pacific Rim Gymnastics Championships, April 27-29, in Medellin, Colombia, following the conclusion of the two-day verification event held at the World Champions Centre in Spring, Texas. 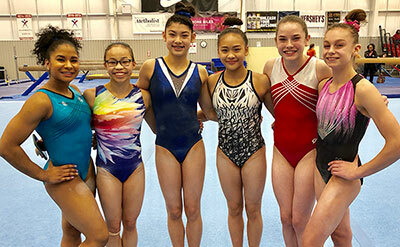 In addition, four juniors were named to the Junior Pan American Championships; 10 gymnasts qualified to the U.S. Championships and U.S. Classic; and five were named to the U.S. Women’s National Team. The three seniors and three juniors on the Pacific Rim Team are: Jordan Bowers of Lincoln, Neb./Solid Rock Gymnastics, junior; Jordan Chiles of Vancouver, Wash./Naydenov Gymnastics, senior; Kayla DiCello of Boyds, Md./Hill's Gymnastics, junior; Morgan Hurd of Middletown, Del./First State Gymnastics, senior; Sunisa Lee of St. Paul, Minn./Midwest Gym Center, junior; and Grace McCallum of Isanti, Minn./Twin City Twisters, senior. The non-traveling alternates are Margzetta Frazier of Erial, N.J./Parkettes, senior; and JaFree Scott of Independence, Mo./GAGE, junior. McCallum was named to the senior team, and Sydney Barros of Woodstock, Ga./Texas Dreams, Bowers, DiCello and Lee were added to the junior national squad. Additionally, the gymnasts going to the Junior Pan American Games are Barros, Bowers, Lee, and Leanne Wong of Overland Park, Kansas/GAGE. Scott is the non-traveling alternate. The athletes who qualified to the U.S. Classic and U.S. Championships are listed below. Those who qualified for the U.S. Championships are also qualified for the U.S. Classic. U.S. Championships: Barros; Bowers; Adeline Kenlin of Coraville, Iowa/Iowa Gym-Nest, senior; Lee; Lilly Lippeatt of Mason, Ohio/Cincinnati Gymnastics, junior; Gabby Perea of Geneva, Ill./Legacy Elite Gymnastics, senior; Alyona Shchennikova of Evergreen, Colo./5280 Gymnastics, senior; Scott; and Wong. The top three in the junior and senior all-around rankings are: senior – McCallum, Hurd and Chiles; and junior – Lee, DiCello and Bowers. The complete results are below. The Pac Rim competition format includes a team (six athletes, five scores designated for team on each event and top four scores count), as well as all-around and individual events for both the senior and junior levels. The verification opportunity was open to members of the women’s national team and other rising gymnasts who were invited to participate. USA Gymnastics is committed to creating a culture that empowers and supports our athletes. The organization has and will continue to take specific and concrete steps to promote athlete safety and prevent future abuse by adopting and vigorously enforcing the USA Gymnastics Safe Sport Policy, which requires mandatory reporting, defines six types of misconduct, sets standards to prohibit grooming behavior and prevent inappropriate interaction, and establishes greater accountability. 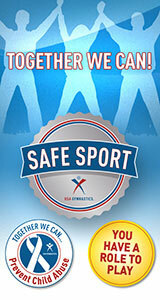 Other efforts taken to strengthen that commitment include establishing a dedicated, toll-free number, 833-844-SAFE, the safe sport email address of safesport@usagym.org, and online reporting to simplify the process for reporting; building a safe sport department that is developing a comprehensive education plan for members; and adopting bylaw amendments to provide the basis for further developing our safe sport programs and governance. USA Gymnastics also has established an Athlete Assistance Fund, in cooperation with the National Gymnastics Foundation, to provide the financial means and guidance for gymnasts who have suffered sexual abuse in the sport of gymnastics to obtain counseling services. The Athlete Assistance Fund, a designated fund of the National Gymnastics Foundation, will be administered by an independent third party.